Valerio has tied on her running shoes all across the country, from the dusty back roads of central New Jersey to the busy Route 222 corridor in Pennsylvania to the sweltering deserts of Arizona. 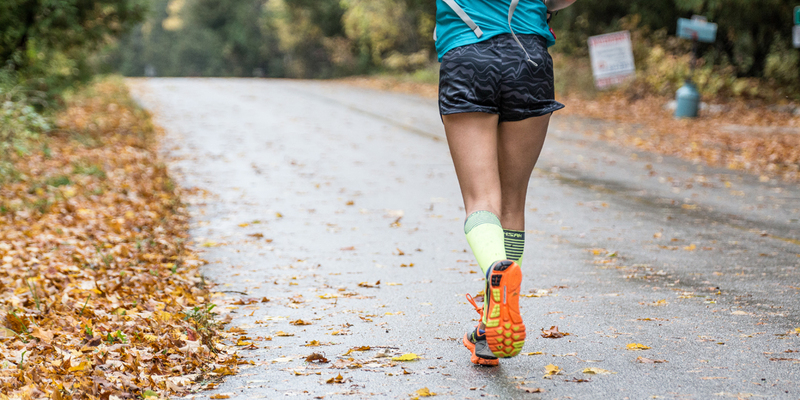 When you meet her on the trail, you might be surprised to see she doesn’t quite fit the typical image of a long-distance runner. She’s neither skinny nor white, and she’s here to show just how misguided these stereotypes can be. In this prejudice-busting, body-positive memoir told with raw honesty, an adventurous spirit, and a sharp sense of humor, Valerio takes listeners along on her journey from first-time racer to ultramarathoner and proves that anyone can become a successful athlete. Rachel Toor was a bookish egghead who ran only to catch a bus. How such an unlikely athlete became a runner of ultramarathons is the story of Personal Record, an exhilarating meditation on the making, and the minutiae, of a runner’s life. The food, the clothes, the races, the injuries, and the watch are all essential to the runner, as readers discover here, and discover why. A chronicle of Toor’s relationship with the sport of running, from her early incarnation as an Oreo-eating couch potato to her emergence as a hard-bodied marathoner, this book explores the sport of running, the community it brings into being, and the personal satisfaction of pursuing it to its limit. An homage to running, a literary take on how an activity can turn into a passion and how a passion can become a way of life, Toor’s book runs all the way from individual achievement—a personal record—to the world of friendship and community. In 2007, Chrissie Wellington shocked the triathlon world by winning the Ironman World Championships in Hawaii. As a newcomer and a complete unknown to the press, Chrissie’s win shook up the sport. A Life without Limits is the story of her rise to the top, a journey that has taken her around the world, from a childhood in England, to the mountains of Nepal, to the oceans of New Zealand, to the trails of Argentina, and finally, across the finish line. Wellington’s first-hand, inspiring story includes all the incredible challenges she has faced – from anorexia, to near-drowning, to training with a controversial coach. But to Wellington, the drama of the sport also presents an opportunity to improve people’s lives. A Life without Limits reveals the heart behind Wellington’s success, along with the diet, training, and motivational techniques that keep her going through one of the world’s most grueling events. Wild is a powerful, blazingly honest memoir: the story of an 1100-mile solo hike that broke down a young woman reeling from catastrophe – and built her back up again. At 22, Cheryl Strayed thought she had lost everything. In the wake of her mother’s death, her family scattered and her own marriage was soon destroyed. Four years later, with nothing more to lose, she made the most impulsive decision of her life: to hike the Pacific Crest Trail from the Mojave Desert through California and Oregon to Washington State – and to do it alone. She had no experience as a long-distance hiker, and the trail was little more than “an idea, vague and outlandish and full of promise.” But it was a promise of piecing back together a life that had come undone. Strayed faced down rattlesnakes and black bears, intense heat and record snowfalls, and both the beauty and loneliness of the trail. Told with great suspense and style, sparkling with warmth and humor, Wild vividly captures the terrors and pleasures of one young woman forging ahead against all odds on a journey that maddened, strengthened, and ultimately healed her. An exceptional athlete. A dominating force. An extraordinary person. Kilian Jornet has conquered some of the toughest physical tests on the planet. He has run up and down Mt. Kilimanjaro faster than any other human being, and struck down world records in every challenge that has been proposed, all before the age of 25. Redefining what is possible, Jornet continually pushes the limits of human ability, astonishing competitors with his near-superhuman fitness and ability. Born and raised at 6,000 feet above sea level in the Spanish Pyrenees, Jornet climbed an 11,000 foot mountain — the highest mountain in the region — at age 5. Now Jornet adores the mountains with the same ferocity with which he runs them. In Run or Die he shares his passion, inviting readers into a fascinating world rich with the beauty of rugged trails and mountain vistas, the pulse-pounding drama of racing, and an intense love for sport and the landscapes that surround him. In his book, Jornet describes his record-breaking runs at Lake Tahoe, Western States 100, Ultra-Trail du Mont-Blanc, and Mount Kilimanjaro–the first of his ambitious Summits of My Life project in which Jornet will attempt to break records climbing the highest peaks on each continent. In turns inspiring, insightful, candid, and deeply personal, this is a book written from the heart of the world’s greatest endurance runner, for whom life presents one simple choice: Run. Or die. Featured in the best-selling book Born to Run, coach and performance guru Eric Orton has spent a lifetime learning and thinking about running and about the limitless possibilities of the human body and mind. In The Cool Impossible, Orton shares his wealth of knowledge in an inspiring step-by-step guide that will open up a new world of achievement for runners of all levels of ability and experience. The truth is: Athleticism is awareness. That simple phrase is at the core of The Cool Impossible. Athleticism requires awareness of form and technique, awareness of our effort level, and, most important, awareness of what we think (and don’ t think). And with that awareness comes the possibility of endless potential and improvement, progress and mastery – and, ultimately, achievement that you never before would have thought possible. With a program focused on proper running form, strength development, and cardiovascular training, Orton will help first-step beginners, prime-time competitors, and enduring veterans reach ” the cool impossible” – the belief that any achievement, athletic or otherwise, is within our reach. Running Away is the story of how one decision can alter the course of a life. Knocked down by a painful divorce and inspired by his father, Powell decided to change his mindset and circumstances. He moved to Boulder and began running in earnest for the first time in his life. Over the 26.2 chapters that follow, Powell grapples with his past relationships, gaining insight and hard-won discipline that give him hope for the future. Overweight, uninspired, and saddled with a pack-and-a-half-a-day smoking habit, Bingham found himself firmly wedged into a middle-age slump. Then two scary trips to the emergency room and a conversation with a happy piano tuner led him to discover running–and changed his life forever. In turns inspiring, poignant, hilarious, and heartbreaking, An Accidental Athlete is the story of the unexpected joys of running–the pride of the finisher’s medal, a bureau-busting t-shirt collection, intense back-of-the-pack strategizing. And one man’s discovery that middle age was not the finish line after all, but only the beginning. Katherine Switzer ran the Boston Marathon in 1967, where she was attacked by one of the event’s directors who wanted to eject her from the all-male race. She fought off the director and finished the race. From the childhood events that inspired her to winning the New York City Marathon in 1974, this book details the struggles and achievements of a pioneering woman in sports. Complete with goal-specific meal plans and nutrient-packed recipes to optimize body composition, ROAR contains personalized nutrition advice for all stages of training and recovery. Customizable meal plans and strengthening exercises come together in a comprehensive plan to build a rock-solid fitness foundation as you build lean muscle where you need it most, strengthen bone, and boost power and endurance. Because women’s physiology changes over time, entire chapters are devoted to staying strong and active through pregnancy and menopause. No matter what your sport is―running, cycling, field sports, triathlons―this book will empower you with the nutrition and fitness knowledge you need to be in the healthiest, fittest, strongest shape of your life. I read Chrissie Wellington’s book on a cruise and it was so good! I am in a new triathlete book club and we are reading A Beautiful Work in Progress for it.